Two part writing occurs when one staff is used for two different instruments, voices, or melody/harmony lines. Four part writing occurs when two staves are used for four different instruments, voices or melody/harmony lines! As a Teacher for over 40 years (YIKES! ), I have noticed how more "sophisticated" music has become - especially for our Elementary Level Students. Composers seem to enjoy challenging students with some two part writing in their compositions. However, the theory concepts of writing music in Two Part Writing are different from the "normal" rules for music. In this Blog, we are going to look at 6 Tips for Two Part Writing. In a 15 Minute Theory Lesson, how can you cover all the required material, make it relevant and prepare your students for exams? Begin with a Lesson Plan that outlines what you want to cover in each lesson. Being prepared to teach using these "done for you" lesson plans will make your 15 Minute Theory Lesson time more effective. If you include theory as part of a piano/violin/voice (etc.) lesson, begin the first 15 minutes of each lesson by teaching the NEW theory concept. Do 1 or 2 exercises during the lesson and assign the rest for homework. Use the Whiteboards for creativity during the lesson. 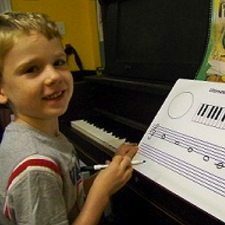 15 Minute - Music Theory Lesson Plans all ready for you to print and use! When marking their homework from the previous week, use the Answer Books for quick and accurate marking. Snip the outside corner of the homework page when both sides are corrected (page numbers are in the middle of the page so they won't be cut off). Have a small garbage can on your desk (you can get a cute one at the dollar store) where you can put the "snips" after your student completes each page and it has been corrected. 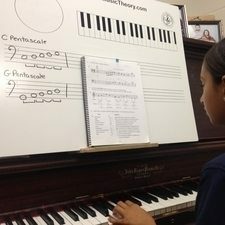 By starting the lesson with theory, the concepts learned can be discovered and analyzed in their music. When do you do the Review Test? The Review Test is done at the end of each lesson and reinforces all the previous concepts. Doing the Review Tests builds confidence and knowledge. Set your goals high. 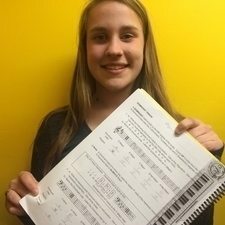 Put a happy face or a sticker on the Review Test if your student gets a mark of over 90%. You may want to add a blues scale or a whole tone scale just to make sure they are "really listening". Incorporating "USE" Ultimate Sight and Ear activities into each lesson builds strong musicianship. Why do you use Whiteboard Activities? Simply because they make learning fun. Use the large and small whiteboards in your studio. By including easy games at the end of each lesson (even for a 1 or 2 minute madness game), students leave feeling happy and confident. 15 Minute Theory Lesson - Yes you can. How? Start each lesson with theory so it becomes a successful habit! When? Every week, set goals, review previous concepts, be successful! Why? Use the tools for learning that bring happiness, joy and inspiration. Use Flashcards or Whiteboard activities at the end of each lesson just for fun.